Chiropractic care can make you healthier - ultimately increasing your quality of life. My chiropractic office is dedicated to helping patients identify the cause of their problems, not merely treat the symptoms. I also educate patients on solutions and on which options might work best for their chiropractic needs. This approach can range from pain management to overall wellness care. I provide thorough consultations to understand your needs and goals, then design a chiropractic health program specifically designed to address your health concerns. I also enjoy teaching patients about spinal health, exercise and prevention, striving toward gentle chiropractic techniques. I will make it my personal goal to be an asset to the community by providing all of its members with the opportunity to have optimum wellness through chiropractic and holistic care, nutrition, and wellness. 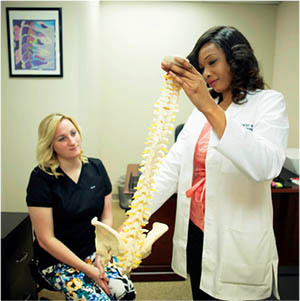 I am dedicated to creating a better community, One Spine at a Time! Call our office at (571) 249-3634 for an appointment today!